Black Sand Basin is located half a mile northwest of the Old Faithful interchange along the Main Loop Road. It is served by an own parking lot, but also connected to the Old Faithful area via the hiking trail along Black Sand Pool and Daisy Geyser. Some thermal features already line the access road and the parking lot. Pentagonal Spring occupies the corner between Main Loop Road and access road. Actually it can be spotted from the roadside, but since it is not possible to stop or park the car there, you have to hike a small distance back from the parking lot. Coming back from Pentagonal Spring you may follow a branch of the boardwalk to the right to observe Opalescent Pool. 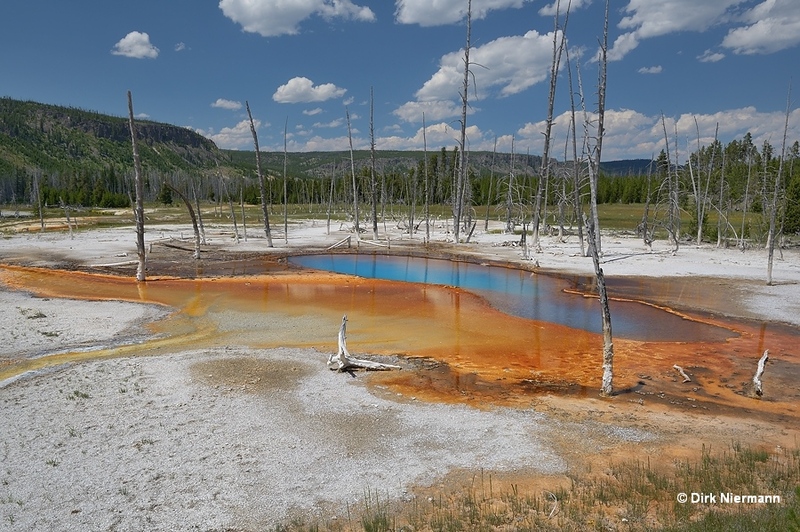 This pool possibly displays the strongest opalescent effect in the park. 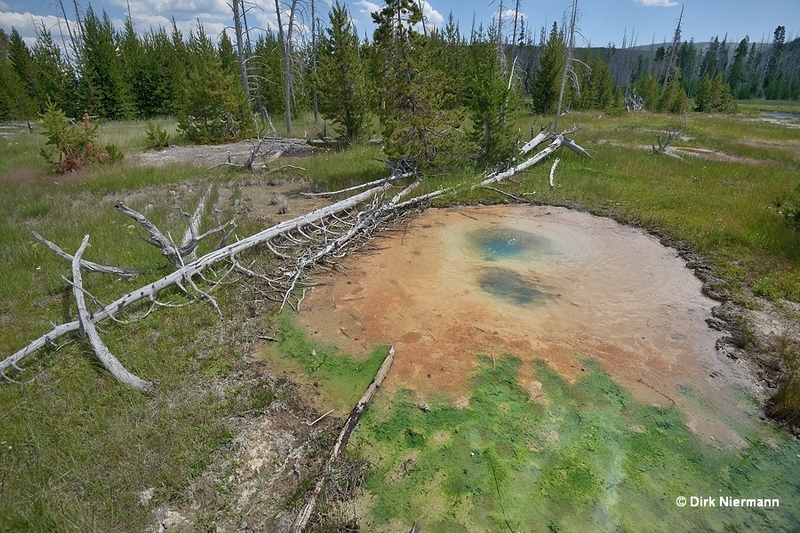 Among the trees beyond Opalescent Pool the small Sunlight Geyser is to be found, and it could be rewarding to look out for its eruptions. 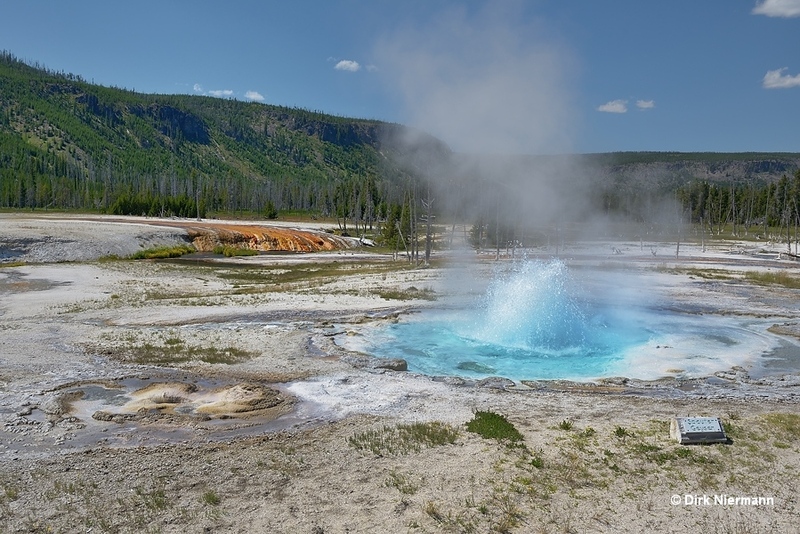 Farther southwest Spouter Geyser often provides an enjoyable spectacle. It is active about one quarter of the time and the water in its snow-white bowl exhibits a delicate sky-blue color. 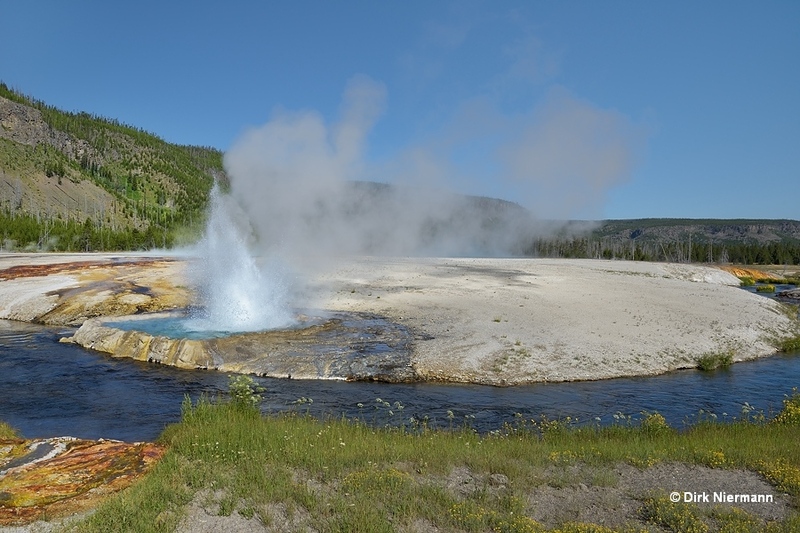 Spouter Geyser plays from two major openings inside the pool as well as from a separate vent on its shoulder. The pool drains completely between active phases. Next to the trail in front of Spouter Geyser a small vent called "The Grumbler" also erupts simultaneously with Spouter. 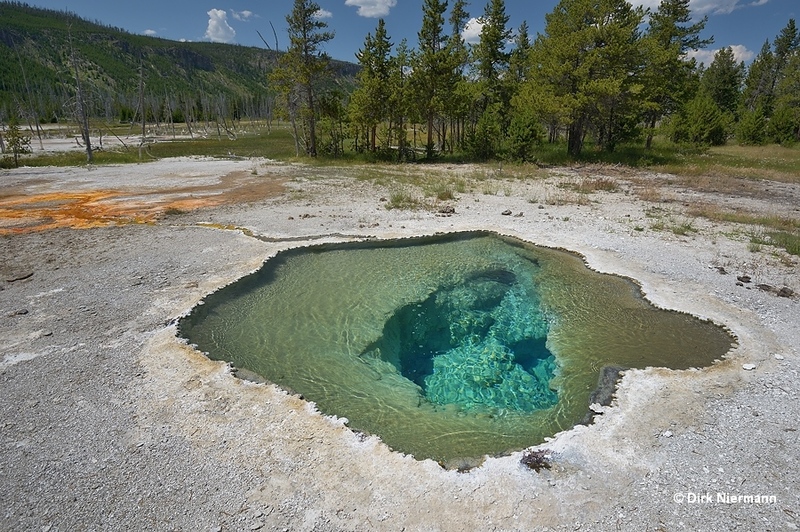 Beyond Spouter Geyser, already on the bank of Iron Spring Creek and a little bit hard to spot, lies Cucumber Spring, which was home of a small perpetual spouter in the past. Another spring shows up across the road from The Grumbler. 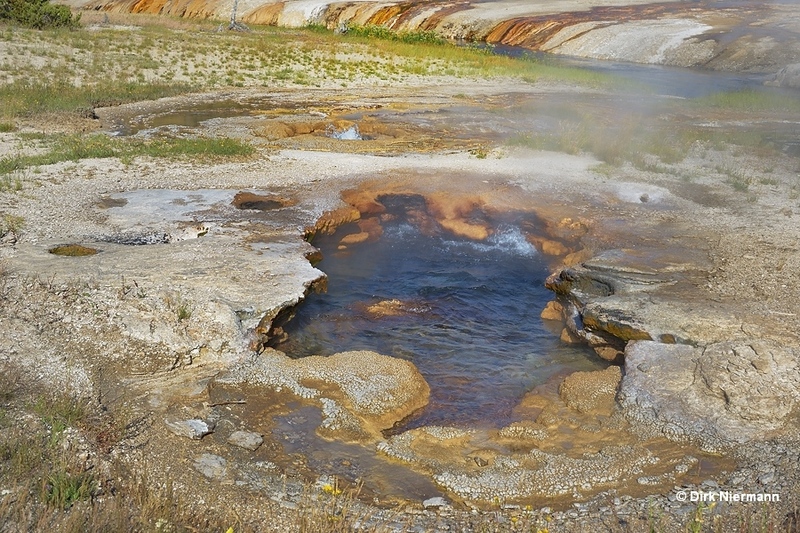 The RCN database lists the feature as Coral Geyser, but both the name and the supplied photo are identical with Coral Geyser of Biscuit Basin. So the validity of the data is arguable. T. Scott Bryan's designation for it is UNNG-BSB-9. 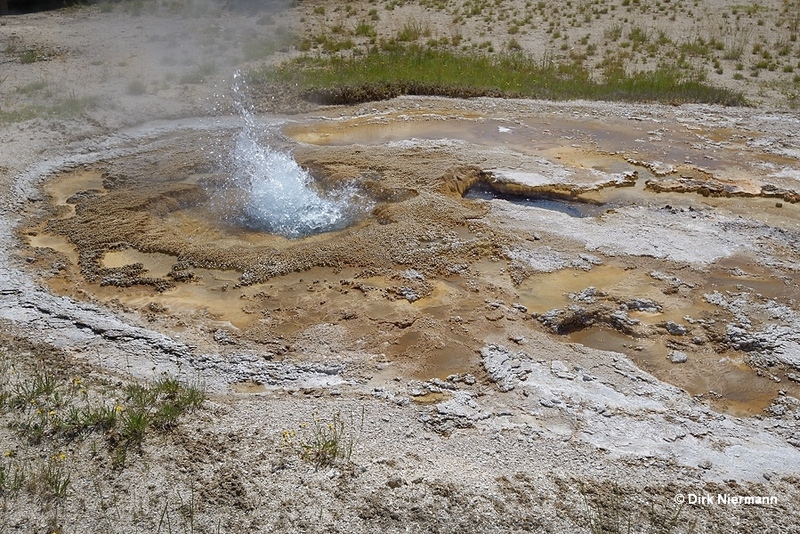 Also west of the parking lot, but on a slightly elevated position on top of a sinter mound and therefore almost invisible, sits Whistle Geyser, whose eruptions are extremely rare. 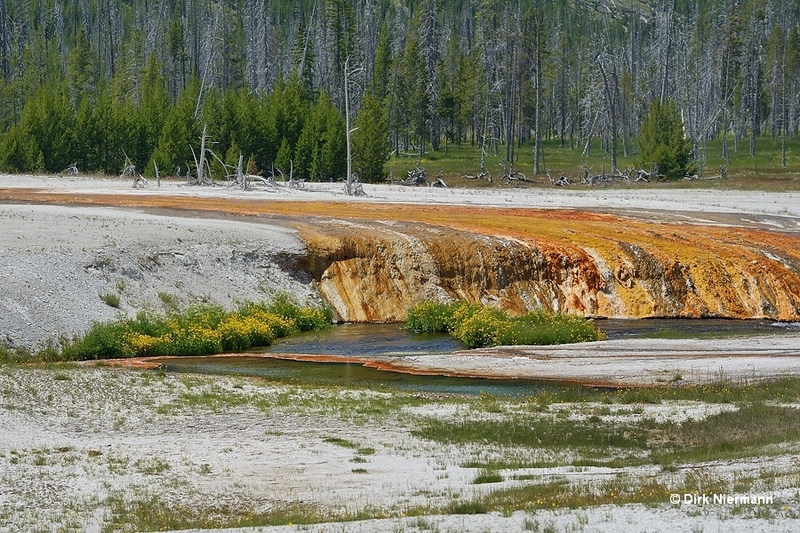 It is regarded as a "dying geyser" at the end of a long lifetime. Cliff Geyser even got an own observation platform. 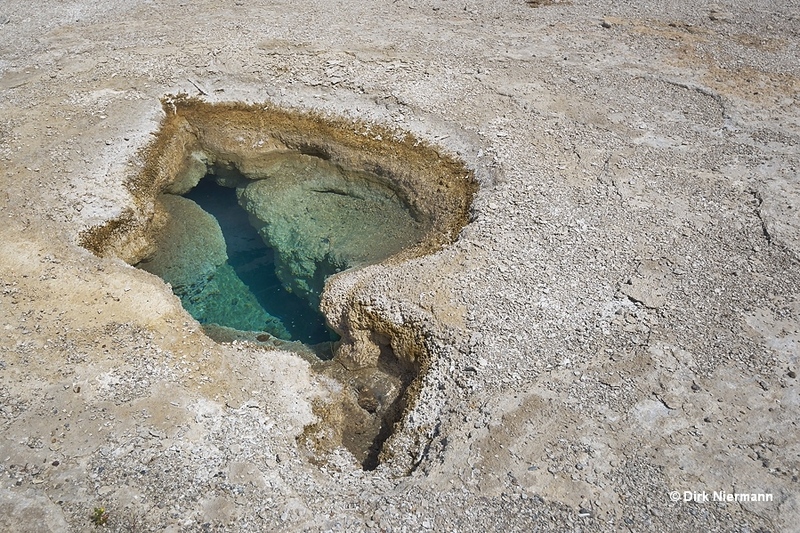 This is easily understandable if you consider the breathtaking panorama, the pretty cliff-shaped geyser crater over the river and the high eruption frequency. 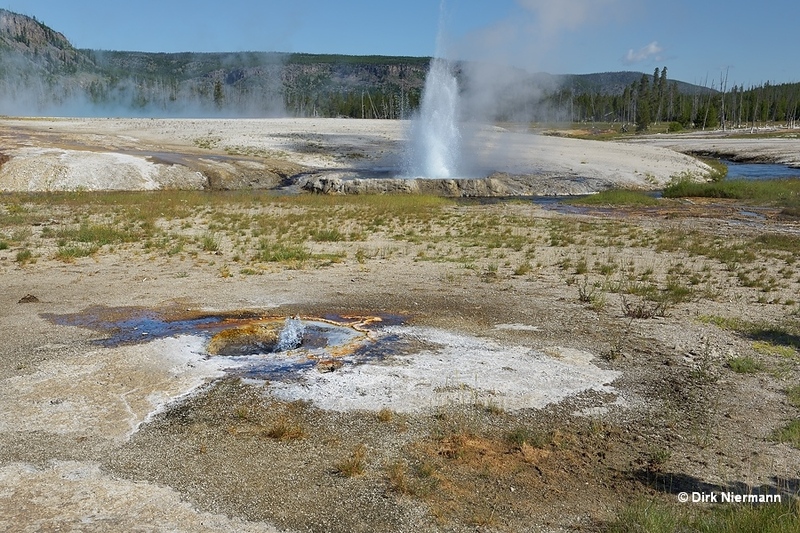 On the west side next to the boardwalk crossing, leading to Cliff's observation platform, two small geysers are playing almost constantly. 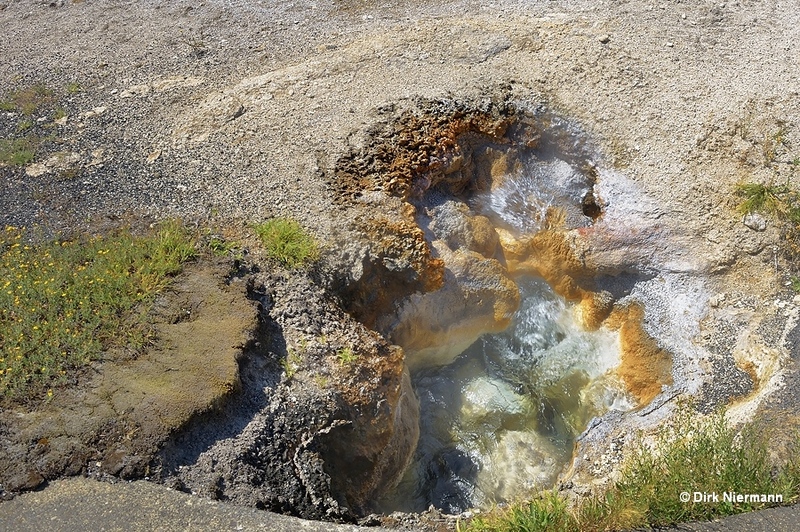 The one closer to the boardwalk is Jagged Spring, which is not only splashing weakly, but sends out single jets of water up to 3 m (15 feet) height from time to time. Sadly, Jagged Spring claimed the life of a 4-year-old girl from Washington in September 1949. She slipped from the hand of an adult, ran into the boiling pool and died almost immediately. Ragged Spring adjoins Jagged Spring on the far side. It splashes approximately 1 m (3 feet) high. A short way down the boardwalk a small, unnamed perpetual spouter seems to increase in activity from year to year. The quiet, unnamed spring across the boardwalk looks like painted with watercolors.